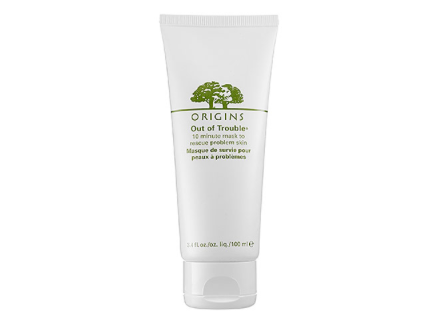 Today, a review on the Origins Out of Trouble Mask, which is a facial mask designed to clear pores. The Clear Improvement contains White Clay, so you have to be careful if you have dry skin. White clay can dry your skin out, depending how much White Clay is uses. We have tested the Origins Out of Trouble Mask, on 3 women and we all agreed on the smell; it has a very nice natural smell. It’s also very easy to apply with a foundation brush. I personally use a cheap foundation brush to apply thicker masks like this one. The Out of Trouble Mask, is quite “aggressive” and drys up the skin, so we would’t advice you to use this facial mask if you have dry skin. If you have normal skin, it’s probably best to use it only on the T-zone. The Out of Trouble Mask, works best on oily skin. It does’t dry you completely out likes Paulas mask, which off course isn’t good for your skin. The hydration of this mask is probably the weakest point, no hydration or what so ever. REMEMBER even if you have oily skin, your skin has to be hydrated! Short-term effects: Tightens and cleans out skin, reduces the size of pores. Long-term effects: Skin produces even more oil. So be careful using this product to often! No hydration. We have mixed feelings about this product. We would think this product works best on oily skin. However, we wouldn’t advice it to use it more than ones a week. This is more a “detoxifying-like” mask that you use once in a while. In conclusion, we think it’s good value for money $ 25,- for 3.4 fl oz/100 ml.